By the power of Grayskull, I HAVE THE POWER! Editor’s Note: I love getting articles from people, and I love posting them if they’re really good. This is a guest post by a Mr. Max Kautsch, and I hope you enjoy it as much as I do. I love EDH. Who doesn’t? I love using cards I’m too cheap to have more than one of. I love using one-ofs from my collection that have never before seen play. I love the staggering deckbuilding possibilities inherent in over 7,000 card choices. One thing I do not love: the way multiplayer games bog down as each player tries to build up for an alpha strike that will defeat one or more opponents while not leaving himself exposed to a deadly counterattack. My solution? A deck that will end the game quickly one way or another. Kill or be killed. None of this interminable posturing and politicking. A deck like that would probably have to involve some devastating combo that can just win the game. So what, you say, kill combos have been done ad nauseam. Ok, maybe so. But by that logic, all control and aggro strategies have “been there done that.” So I think the question becomes, what would be a unique, not-too-broken way to combo out against all your opponents at once in EDH? When I Gathered (I’m going to use Magiccards.info for the links. Why? Because I’m the editor, that’s why – MTGCP) for possible combolicious generals, I couldn’t help but notice that the rules text for Sek’Kuar, Deathkeeper beings with the word “whenever”. As all good Johnnys know, “whenever” can be the key to going infinite. So why not give it a shot? Even though it's over I'm going to tell my wife about the affair. See, that’s a bad idea since you’re wasting money on something you don’t own. The whole ad had the men spout out such ideas to promote the brand “Bad Idea Jeans” much like if you’re going to advertise a perfume called “Whisper” you have the people in the ad whisper. What does this have to do with our friend Tarmogoyf? Well, we’re going to be talking about EDH deck construction today. In EDH, he’s a pair of Bad Idea Jeans. It came to my attention (I believe through Trick Jarrett at Mananation.com) about a new EDH variant called Peasant Dragon Highlander (PDH). For those of you unfamiliar with the concept of Peasant, it’s the idea of not using rares to build your deck so it’s much more budget friendly. I know that some people complain about some of the rares such as the Revised Duals being way too expensive for use in EDH (I kinda agree to that). If you’re looking for a more wallet friendly option, but still love the idea of EDH, I might suggest giving this format a chance. This idea is even making me consider building one of my own PDH decks. I would like to introduce to you a format that I’ve been playing with my friends for the last couple of months. It was created by the card dealers at Frank and Sons in SoCal, who had way too much time and commons/uncommons on their hands. We wanted to create a format that was both afforable and presented a variety of different strategies. I’ve found out that the fact that the format is afforable allowed us to build more decks, contributing to the discovery of new strategies and creating a heathly metagame. Your general can be any non-rare non-promo creature. Anything that was ever rare is considered rare regardless of previous or current rarity (Hypnotic specter was uncommon in ealier sets, now it is rare.) Other examples include: Serra Angel, Loxodon Warhammer. Keep in mind, these are only suggestions. We’ve banned any card over 30 dollars (FoW, Mana Drain) as a general house rule because those cards tend to be promblematic in powerlevel as well. Yes, this format is intended not to be multiplayer, but it could be exciting. While Sol Ring is banned (a favorite and rumored to be in the From the Vault: Relics set coming out in August), there are still plenty of good commons and uncommon cards to make a deck. There are still different ideas but same concept decks that you can do since only very few variables changed (Life, rarity, 1v1, banned list). Tinker is still allowed (Most powerful artifacts are rare) and Channel is still okay (very few Eldrazi). I’ve heard of Jonathan Media of MTGMetaGame.com (Now DoublingSeason.com) building a Rhox War Monx deck. I’m seriously thinking about wanting to build a few of these to let other people that haven’t played EDH before get a chance at the format without letting them play with my expensive cards (I don’t know how people shuffle and I’m sacred sometimes of them ruining my cards). Plus, it’s another chance to play different cards that I wouldn’t because they wouldn’t make the cut in a regular EDH deck. Let me pose you guys these questions: A) Are you guys interested in this format as a change of pace and B) would you like some coverage here on 99EDH? Share your thoughts either on twitter (@mtgcolorpie) or down below. Editor’s Note: It’s the time again. Fan favorite Jake Kessler is back once again with a new EDH post. This was originally seen on the highly recommended Magic Deck Vortex and on Jake’s on blog, Competitive Casual, and is being published here with permission from both of them. I kept wanting to write the title as Mana Said Knock You Out. I have a few EDH decks together at any given time; I think at present I have about five or six. This time, my general is a real mother. I’m certainly not the only person ever to make a Wort deck, and there are several clear directions a deck builder might run with her. But let’s do something a little differently for this article. Rather than break down the deck, let’s first break down the general. So what sort of card, exactly, is Wort the Raidmother? Perhaps the flashiest aspect of Wort is her conspire ability. Players have always been excited by opportunities to copy spells, from Fork in Alpha all the way up to Echo Mage in Rise of the Eldrazi. This is especially true in EDH, where longer games and multiple opponents mean really big spells have the potential to be truly powerful. And here’s the home stretch (White, Blue, Black, Red and Green). There’s not much more I can say but hope you guys have enjoyed the articles. I am curious about how you like this rather then the one really long post. Of course, I’ll spread these out better next time if you do like them since the 1-2-3 posts a day is really throwing me for a loop. Really? 6 posts in 3 days. That’s almost unheard of. I know you would like it a little more like that but there’s only so much time in the day to write. This last section are for the cards that can go in almost every EDH deck (except some of the lands). These cards tend to be a little more powerful because they can go into any deck. If you’re going to get foils of cards, it’s usually these that fetch the most money. Cards in italics are reprints. At the very end of THIS REVIEW, you’ll get my Top 10 list of EDH cards for M11. Exciting that it’s almost here, right? Any predictions? Like any time when I review these cards, most of them can see play in EDH; there’s only one in this set that is absolute trash in EDH (Squadron Hawk). These are just going to be the better cards I would recommend playing. Primeval Titan will watch you sleep. And now comes the last of the actual colors (White, Blue, Black, Red are there). With Green comes a whole influx of creatures. That really shouldn’t be all that surprising, should it? White is about gain life and prevent damage and making sure everything is in order. Black kills things, anything to do to win. Blue counters, draws and bounces everything but doesn’t really destroy anything. Red burns and creates havoc while destroying what it can. Green is all about nature and lands and creatures. My philosophy about Green is it can do anything it wants as long as it’s creature or land related. So while Hornet Sting stands out, it can still, somewhat seem Green related. To see more of my design philosophies, head over to my Magic design blog: mtgcolorpie.com. I’ve noticed that a number of people come over there to this site, but not the other way around. Thought I’d cross-promote it a little bit. Cards in italics are reprints. 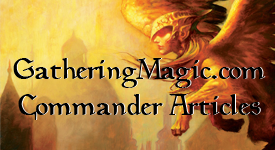 At the very end of all the reviews, you’ll get my Top 10 list of EDH cards for M11. Do you really need to keep that 1995 SI Swimsuit issue? Entering part four of this series (White, Blue, Black). Luckily this series isn’t like Lost where you have to have see the previous in the series or it will all not make sense. Because I’m not building on the last post, each one of these can be read separately if you’re curious about one certain card from the set. I guess that’s one benefit of breaking them, up by color. But what these colors have in common are three cycles of Rare/Mythic cards: The Planeswalkers, the Titans and the Leylines. Not all of them are made equal. The Red one really only works against White (sometimes Green) decks, so I didn’t even mention it down below; the Blue Titan is clearly the worst. In any cycle, there must be a best and and worst; it’s just odd nod seeing Green at the bottom of those cycles.